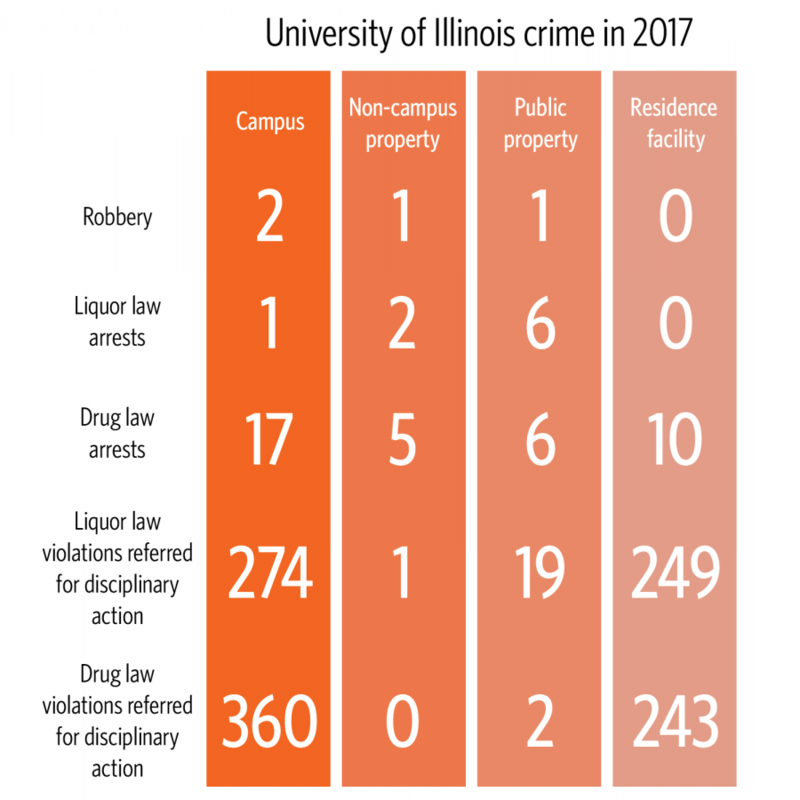 The University police department reported an increase in certain reported criminal offenses from 2016 to 2017. There were more liquor law arrests, liquor law violations referred for disciplinary action and drug law violations referred for disciplinary action. Drug law arrests, however, declined. Pat Wade, communications director for UIPD, said they issue fewer drinking tickets than people would expect. In 2017, UIPD issued nine total drinking tickets on or adjacent to campus property, meaning on-campus or non-campus property, in a residence facility or on public property. UIPD issued five drinking tickets in 2016. Instead of issuing a drinking ticket, UIPD tries to refer students to the student disciplinary office. For 2017, there were 543 liquor law violations referred for disciplinary action. In 2016 there were 506 referrals. Wade said it’s been a consistent trend throughout the past few years to have more disciplinary referrals than drinking tickets. UIPD takes the same approach with minor drug violations. In 2017 there were 38 drug law arrests versus 605 drug law violations referred for disciplinary action. For 2016, there were 75 drug law arrests and 422 drug law violations referred for disciplinary action. “(Drug law arrests) could be a notice to appear in court. In Urbana you can issue a civil ticket; it’s essentially a ticket for minor drugs like marijuana,” Wade said. However, Wade said there are some more addictive drugs the police department has more serious concerns with. More serious drug violations do happen on campus as well. UIPD has investigative units who try to weed out the high-volume drug dealers on campus through a variety of investigative practices, Wade said. For drugs, there are two levels: the more minor violations and the larger scale drug dealing. Beginning in 2017 for the state of Illinois, possession of fewer than 10 grams of marijuana became a civil violation, which is similar to a traffic ticket. “That was another avenue, that gave us another tool on the tool belt, so to speak, where we can either issue a ticket instead of arresting someone or send them to the student disciplinary process,” Wade said. Theft is the most common crime on college campuses, Wade said. Theft is property crime and can be significant. Usually, someone gets something like their cellphone, wallet or bike stolen. UIPD does take theft seriously, Wade said, because it causes a huge disruption in someone’s life when it happens. Robbery is a more serious crime. There is a threat of force associated, meaning someone has a weapon, like a gun or a knife, or implies that they have a weapon. The offender takes the victim’s property from them while they are standing there. The victim has a personal interaction with the offender. Wade said robberies are far and few between. In 2017, there were four reported robberies; in 2016, there were five. The Champaign Police Department refers crimes to UIPD unless the crime occurred on city property. 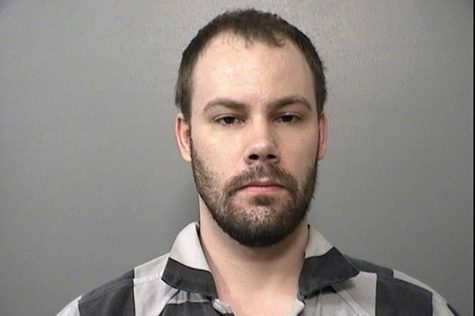 “The U of I spans several law enforcement jurisdictions so it’s possible that any one of several departments could handle a call involving a U of I student (state, Urbana, Champaign, UI police and the county sheriff),” Bruce Ramseyer, Champaign police patrol lieutenant, wrote in an email. Wade said UIPD takes the approach that any crime is a crime, violent or not. As a police department, he said, they have to enforce the law and hold people accountable. This can mean different things depending on the crime and history of the person committing it. With a petty theft, for example, Wade said if it is the person’s first offense, they’re remorseful about it and they cooperated and told the truth, then UIPD will most likely send the student through the disciplinary process. That way, the student isn’t getting into the criminal justice system where there is a record of the crime. Repeat offenders probably won’t go through the student disciplinary process. UIPD’s approach does depend on a variety of factors like the history of the offender and the effect on the victim. Ramseyer wrote that the Champaign police department’s approach to crime is generally the same as other towns. Students are not handled differently. However, they do answer to the University in addition to criminal law. Ramseyer explained there isn’t an immediate request for University involvement, but they do share the information in the following days. No matter how petty the crime may seem, Wade said the UIPD have to enforce the law.